How to make MAPLE SYRUP SNOW CANDY in your own backyard just like Laura did in Little House in the Prairie. Snow candy is delicious, and made by pouring hot maple syrup on a bed of snow. Here’s how you do it in 3 simple steps. 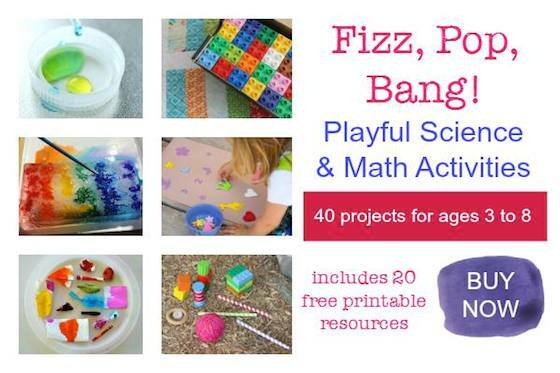 Making homemade candy on the snow is a classic winter activity to do with your family in the backyard or in the school yard with the students in your class. 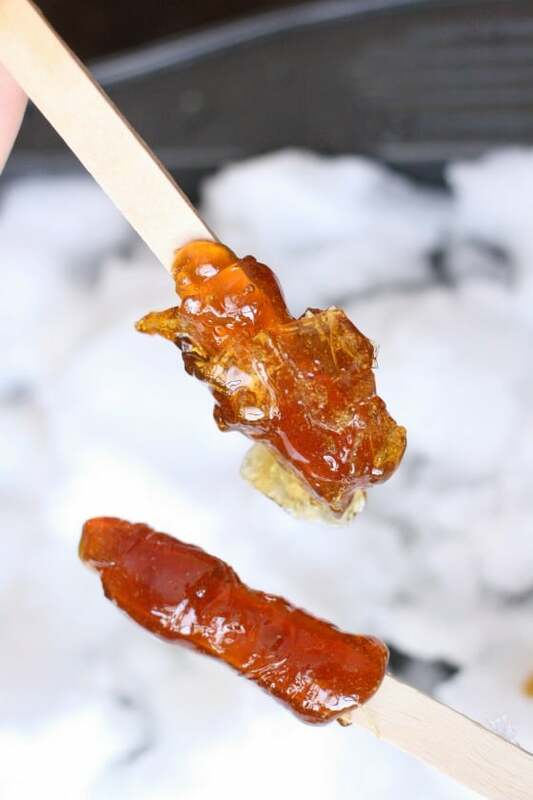 To make maple syrup snow candy, also known as snow taffy or maple syrup taffy all you need are two things: real maple syrup and clean, fresh snow! We were all about classic Canadian winter-time treats here this past weekend. Did you see the amazing snow ice cream we made on Sunday? 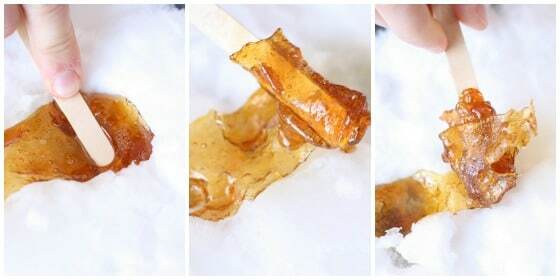 Well, today’s maple syrup snow candy is another fab recipe for you and your kids to try before the snow melts. Making maple candy or maple taffy on the snow is a popular winter tradition here in Canada. 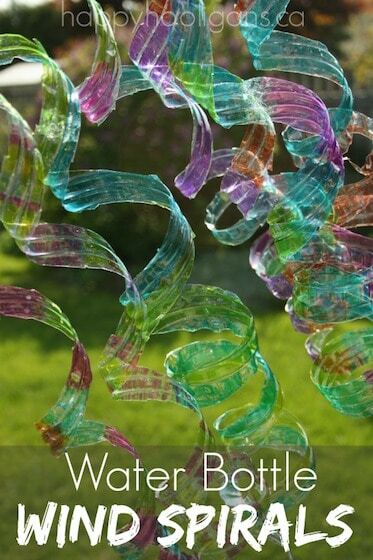 It’s a regular activity at outdoor winter carnivals and at maple syrup festivals in late winter and early spring. This is when the maple trees are tapped, and the sap from the trees is collected in buckets and boiled into maple syrup. Snow taffy is really fun to make. It’s literally as easy as 1-2-3. What IS maple syrup snow candy? In case you’ve never heard of it before. 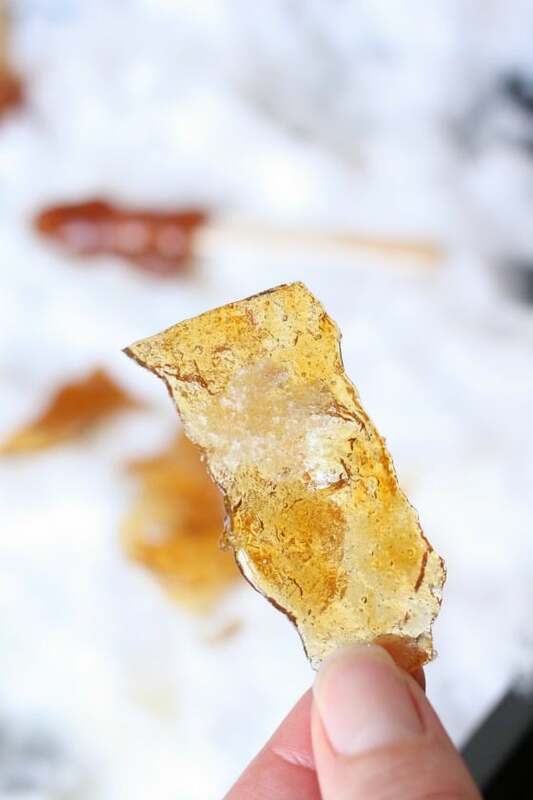 Maple syrup snow candy is candy in its simplest form. It’s made by pouring boiling maple syrup on a clean, fresh bed of snow. The cold snow instantly stops the syrup from cooking, and cools it to the consistency of taffy. Today I’m going to show you how you can make this Canadian treat in your own back yard, in 3 easy steps. 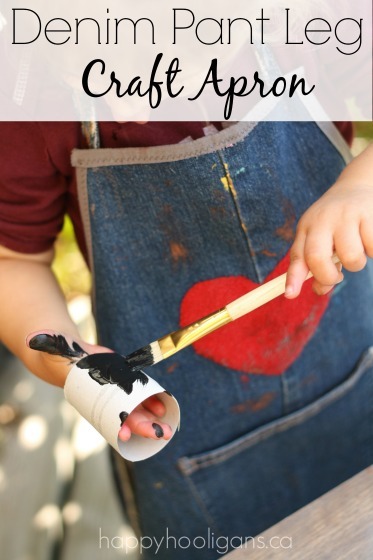 The process is quick and simple, and it’s a lot of fun. 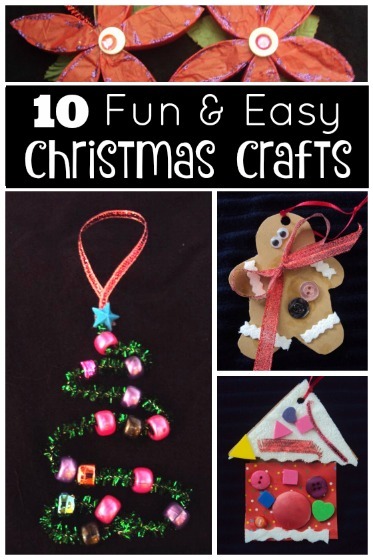 This would be a great weekend activity to do with your family after a fresh snowfall or with a group of students in the school yard. As long as you have a fresh, clean snow on hand, you’re good to go. To tell you the truth, we did not make this batch of candy outside. The temperatures this past weekend were nearing -40, which made conditions unbearable out in the yard, so we brought the snow inside and made our candy in the comfort of our house. How much maple syrup do you need to make maple syrup candy? The amount really depends on how much candy you want to make. Many recipes call for 2 cups of maple syrup, but that is a LOT of syrup. We only wanted to make a few pieces of candy. In addition, we didn’t have very much maple syrup on hand, so we only used 1/4 cup. That yielded 2 maple syrup candy pops and a couple of individual pieces of maple candy. 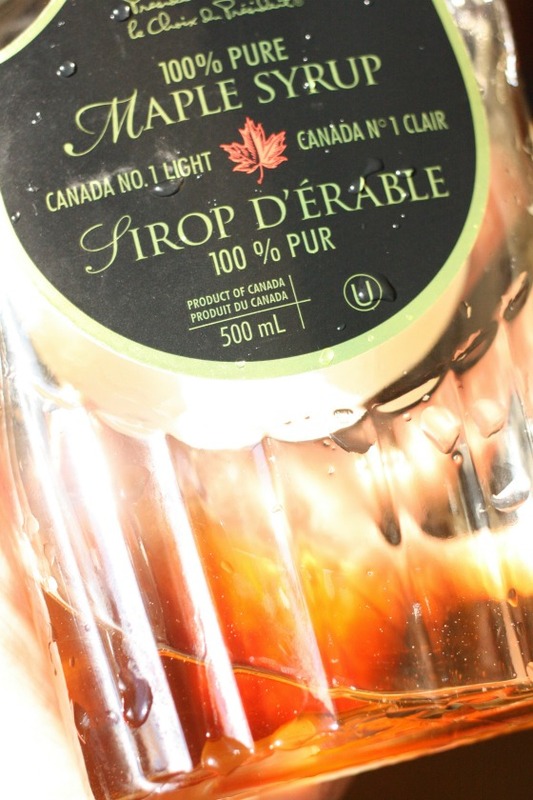 Oh, and by “pure” maple syrup, I mean PURE. We’re not talkin’ grocery store brands here. We’re talkin’ 100% pure, maple syrup. From the maple tree, nothing artificial added. 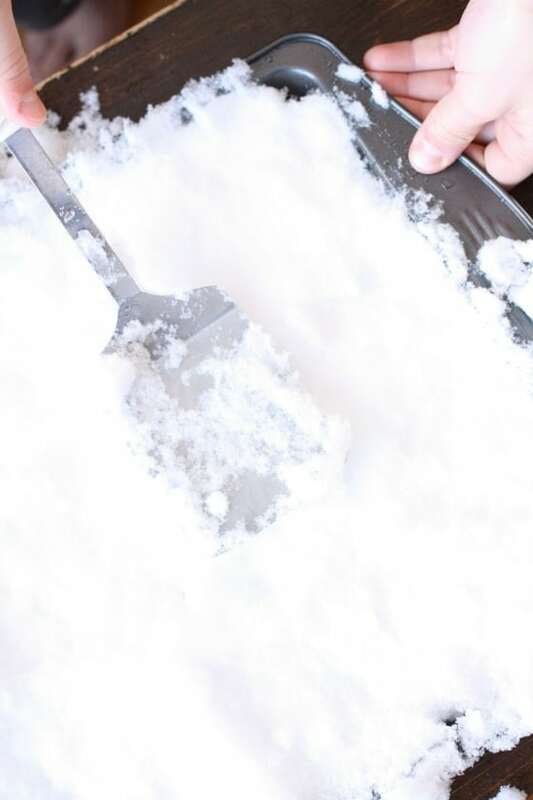 If you’ll be making your candy outdoors, pack down an area of snow. You want this area to be nice and firm so it holds the hot syrup. 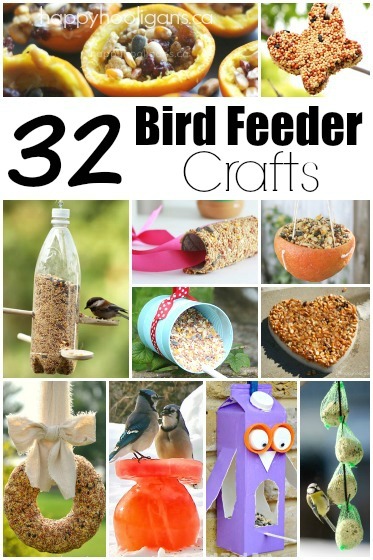 Alternatively, you could fill a platter or a baking sheet with a layer of packed down snow. Obviously, if you’re working inside, like we were, you’ll need to use the platter or baking sheet. 1. Pour your syrup into a small pot and heat it until boiling. Once boiling, the syrup will start to bubble. Using a candy thermometer to gauge the temperature, continue to boil the syrup until it reaches the “soft ball” stage (235-240 degrees farenheit). If you pass the soft ball stage, don’t worry. Your candy will just be more crunchy than chewy. 2. 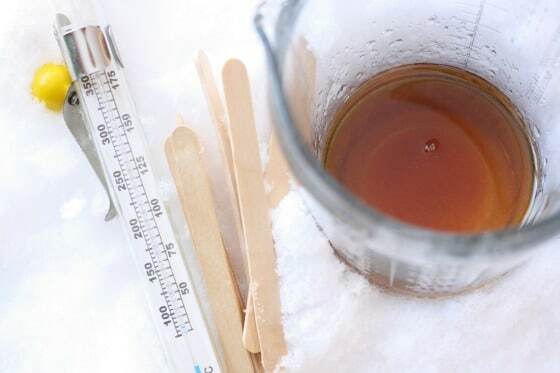 Remove the pot from the heat and pour your syrup in lines on the snow. BE CAREFUL. The syrup is VERY hot. 3. 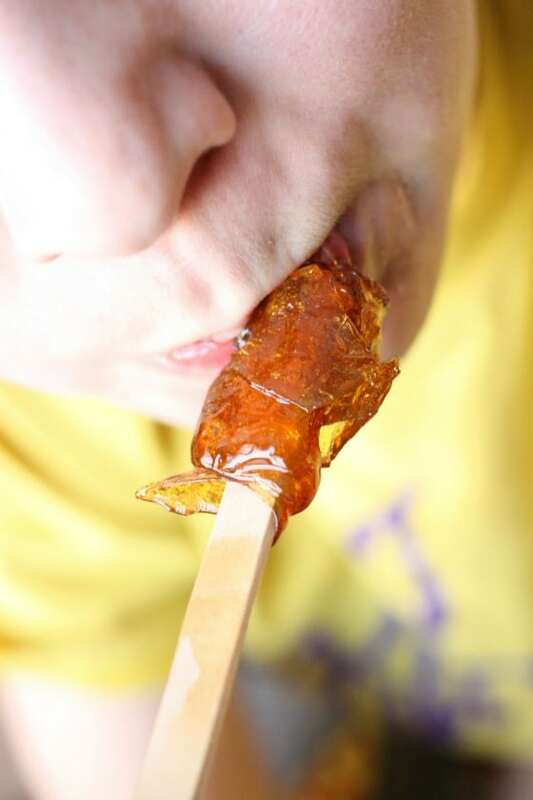 Press a craft/popsicle stick into the syrup and then as the syrup is cooling, roll it up around the stick. 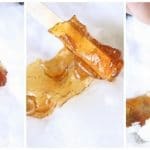 You’ll end up with a beee-autiful maple syrup candy pop! 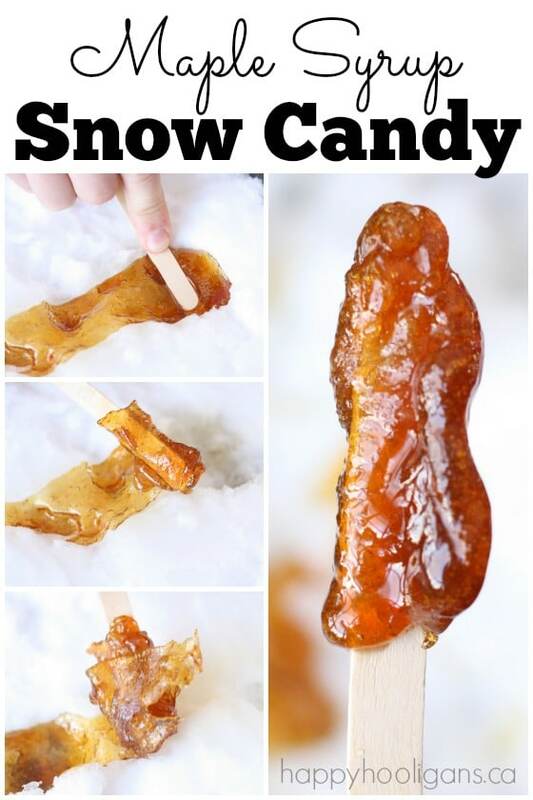 You can also pour small puddles of syrup on the snow to make individual pieces of candy. Mmm-mmm! A good, old fashioned, maple syrup treat! 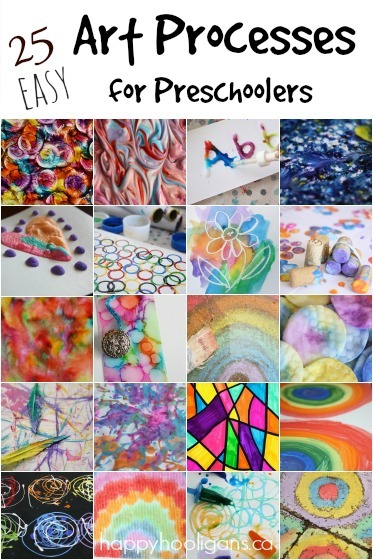 Get out there and make the most of the season! 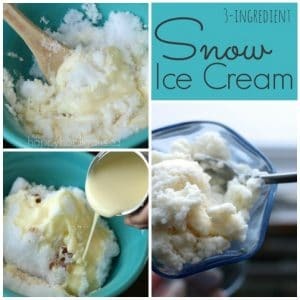 Be sure to check out our snow ice cream too! 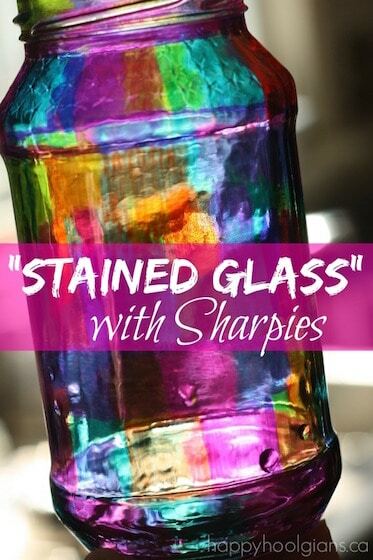 …and Princess Pinky Girl’s amazing candy shot glasses made from Jolly Ranchers! Thank you for the Vanilla Snow Ice Cream and Maple syrup Snow Candy! At the superstore I’ve found that the canned syrup is probably the cheapest and tastes amazing, even better that the presidents choice. You just have to go to the isle with the 100% syrup products and they should have it there. The syrup that comes in that beige jug is really good too, Im pretty sure the can I have is from the same brand. We tried this last year and the hot syrup just melted the snow – we ended up with maple slush…lol. Any idea why that happened? You need to pack down the snow very firmly so it supports the hot syrup, Lora. If the snow is too “loose”, it will melt. It really needs to be at a boil at the the candy stage. Likely wasn’t hot enough. I had this problem too. We did pack our snow down but it was a very light, fluffy snow to begin with. It just made a wet mess and was syrup wasted. 🙁 Maybe we’ll try again with an icier snow and be sure to pack VERY firmly. Ooo, yes, the snow does need to be very firmly packed so it doesn’t melt when the boiling liquid hits it. I hope you’ll try it again when the snow is a little heavier, Sarah. It really is a treat! I wanted to do this with my group of Brownies but we meet in the school gym so I don’t have a saucepan. Can you let me know if this can be done in a microwave? I think it likely could be, Caroline. You might not be able to get it hot enough. That heat level is essential. Take a candy thermometer and take precautions that it doesn’t make a mess boiling over in the microwave. Like another reader I was mislead by the “no grocery store” and “straight from the tree” comment. Having read the section in Little House where they make maple syrup snow candy, I am pretty sure that what she meant was that you need to use real maple syrup, which you CAN find at most grocery stores, but don’t use pancake syrup (i.e. corn syrup based). Disregard the “straight from the tree.” She does not actually want you to attempt to tap a maple tree for the sap for this. As we all know, syrup does not come “straight from the tree.” Instead, the sap must be boiled to make syrup. “Straight from the tree’ ….. You understand syrup doesn’t come from the tree like that right?? If it was straight from the tree it would be thin and clear like sweet water. Thanks Sue. I’ve edited that line to be more clear. What I meant to convey that it was “straight” and not cut with any sugars or artificial ingredients. Since I don’t have snow, would ice work? The snow outside is dirty and brown. It might work if you crush it finely in the blender so it’s more like the consistency of snow, Crystal.